To give our readers better insight into the global mobile games industry, we’ve teamed up with market data firm Sensor Tower to bring you exclusive weekly charts from key countries. These rank games by free downloads, paid downloads and the top grossers across the App Store and Google Play. Each week we’ll be covering the US, Great Britain and Ireland, and China (iOS only) markets. This week's charts cover the period from December 31st to January 6th. 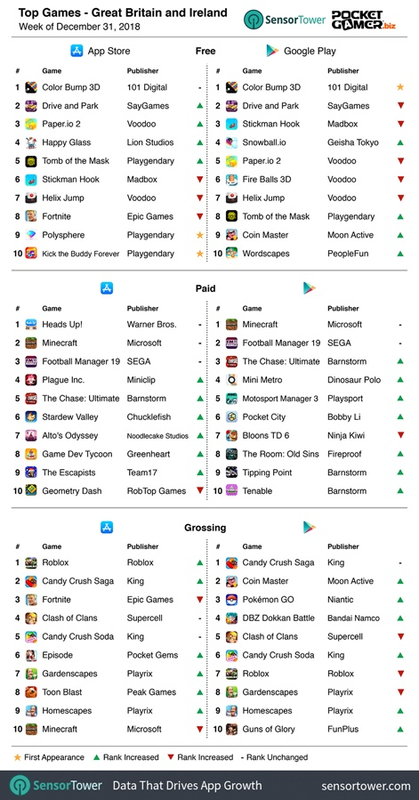 Roblox saw some consolidation in the iOS grossing chart and remained in second for the week. It did, however, fall to ninth on the Google Play grossing charts. Other movers saw Niantic’s Pokemon Go and MZ’s Final Fantasy XV: A New Empire break back into the top 10 grossing rankings in 10th on iOS and Android respectively. Elsewhere, Playgendary's Polysphere climbed to second in both the iOS and Google Play free-to-play download charts. 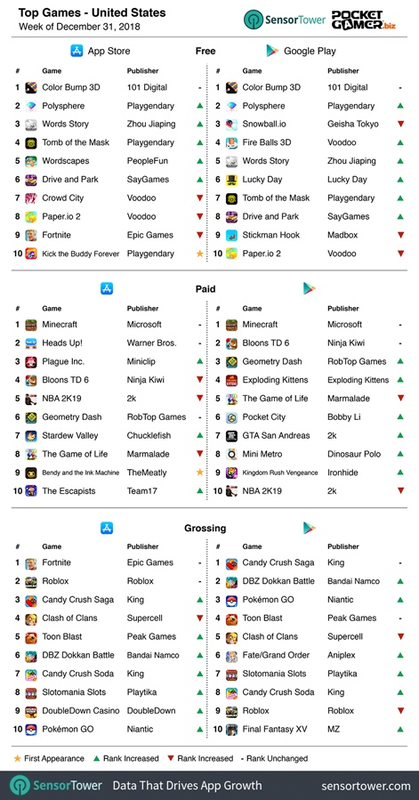 While Roblox also fell to seventh on the Google Play grossing chart for the week, it moved up to the top spot on the iOS grossing list. Elsewhere, Niantic’s Pokemon Go and Bandai Namco’s DBZ Dokkan Battle moved up to third and fourth on the Google Play grossing chart. 101 Digital’s Colour Bump 3D made its debut on the Google Play free-to-play download rankings and took the top spot. The hyper-casual title also maintained the top spot of the free-to-play iOS chart. 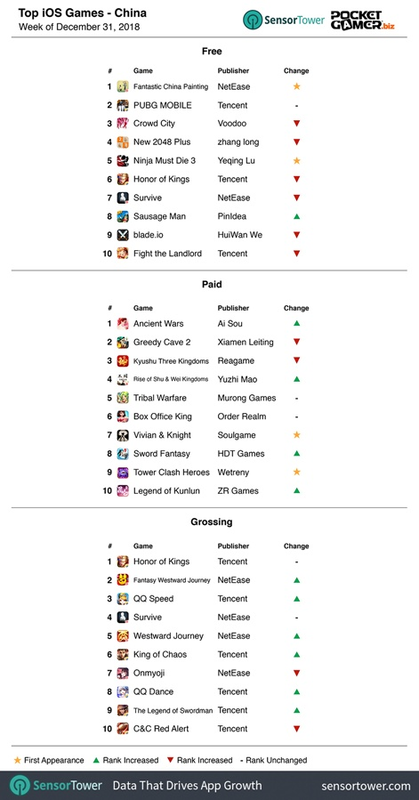 The Chinese iOS free-to-play download chart saw NetEase’s debuting Fantastic China Painting take the top spot. Yeqing Lu’s Ninja Must Die 3 also made its debut in fifth. On top of that, Soulgame’s Vivan and Knight and Wetreny’s Tower Clash Heroes debuted at seventh and ninth respectively on the iOS premium download rankings. Ai Sou’s Ancient Wars moved to the top of the iOS premium download chart, and NetEase’s Fantasy Westward Story took second spot once again on the iOS grossing list. You'll find speakers from many of the companies mentioned above, including NetEase, at Pocket Gamer Connects London 2019 on January 21st to 22nd.